As the global marijuana industry booms, one little company has just hit a huge payday. Scythian Biosciences Corp. (TSXV: SCYB.V; OTC:SCCYF) is a tiny company with a big secret: a way to turn cannabis assets across the world into investments worth hundreds of millions. The company is making a transition from biosciences to investment, and it’s just struck it rich. Scythian has accomplished a huge coupe: it’s agreed to sell its assets in Jamaica and Latin America to Aphria, the marijuana giant, for $193 million. That’s because weed is GLOBAL. It’s much, much more than Canada and the US. The global weed sector could be worth $57 billion in just years, and that is mainly focused on the recreational market. But there are better ways to profit from the Green Revolution…ways that the hedge funds and venture capitalists haven’t discovered yet. Scythian knows the secrets to making minor marijuana assets into a $193 million investment. It’s the only truly global cannabis opportunity spotter, an incubator for marijuana ventures and research throughout the world. Everyone’s been paying attention to the North American weed market…but they’ve been missing the big picture. 1.37 billion people in Europe and Latin America could soon gain access to legal marijuana. And most people have no idea. But the team at Scythian Biosciences Corp. (TSXV: SCYB.V; OTC:SCCYF) sure does. They’ve got a presence in some of the key markets there, and now they’re targeting acquiring new investments in Brazil. Scythian’s got millions of dollars in seed money from Aphria Inc. (OTCMKTS: APHQF), a $2.952 billion behemoth and one of the biggest sharks in the cannabis sector. And what they’ve done is ingenuous: acquiring and incubating assets with cash from Aphria, only to sell them back for a huge payday. Scythian is going to make $193 million from its sale of assets to Aphria… and plans are for this to be just the beginning. They’re getting ready to duplicate this type of deal over and over, aiming for high profits. Cannabis has been one of the biggest stories of 2018…but few have grasped the size of the opportunity. The move from illegal to legal is happening at a rapid pace. A report from Arcview Market Research and BDS Analytics found cannabis sales accounted for $9.5 billion in consumer spending. The total size of the global cannabis market is estimated to reach $32 billion by 2022 and $57 billion by 2027. 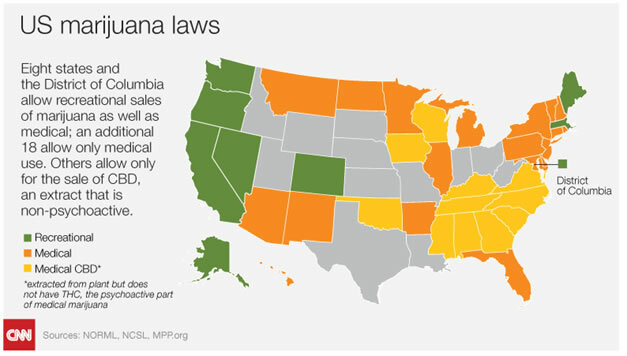 The bulk of pot sales are in the United States, which at the moment has a patchwork of state regulations dictating how marijuana can be sold and consumed legally. But North American pot consumption is bound to rise rapidly, led by groundbreaking Canadian legalization this year. Canadians spent $5.7 billion on cannabis products in 2017, but with recreational pot now about to be legal, that figure could explode as millions of new users start lighting up legally. Across North America, marijuana is having its best year ever. Support for legalizing weed across the U.S. is at its highest level in years—polls find as much as 80 percent in favor. And the limited space for medical marijuana is blossoming into a much broader market, one that includes recreational marijuana use and marijuana-based pharmaceutical products. The FDA, for instance, just approved the first ever drug based on cannabis. States are rushing towards legalization: super-conservative Oklahoma, for instance, just legalized medical marijuana, becoming the 30th state to do so. States like Oklahoma are desperate for tax revenue…the kind that a new green pot industry could bring generate. States like Vermont, Michigan and California are lining up to expand pot and make a killing. With such momentum, $57 billion by 2027 may be a conservative estimate. The greener North America gets, the bigger the opportunity in pot becomes. North America is driving an investment surge in the cannabis sector. But the opportunity is even bigger than people have realized. Scythian Biosciences Corp. (TSXV: SCYB.V; OTC:SCCYF) is unique because it taps into this opportunity…something that firms focused on North America have overlooked. The company got its start in biosciences, but now it’s made the transition to investing and incubating marijuana assets. Scythian’s approach is to identify quality assets and build them up into something of value—an approach it clearly demonstrated with its recently announced asset sale to Aphria. Scythian’s model gains exposure to the whole global cannabis market and accesses assets that, when they meet their goals, can go from pennies to millions in just a few short months. One such avenue for exposure is in Latin America, where Scythian has already laid down a foundation. And the European market could be even bigger. The continent has twice as many people as the U.S. and could provide double the sales, once laws are relaxed. Scythian has a plan in place to tap into the European market, laying a foundation in a number of key markets including Italy and the United Kingdom. The UK, where new cannabis laws could be just around the corner, could be a huge opportunity—a country where black market marijuana sales totaled $3.46 billion and counted 3 million users. When European laws change, Scythian should be in prime position to seize a chunk of the market. Scythian’s (TSXV: SCYB.V; OTC:SCCYF) plan is bigger than just production and distribution. The company invests in every part of the cannabis supply chain. It is also setting out to incubate marijuana distributors across the world—building markets that both Aphria and Scythian can exploit with Canadian pot. There are lots of different opportunities for Scythian to hit it big. A consumer marijuana product, a “Coca Cola” for pot smokers, could let it tap into the recreational market. A “Pfizer,” on the other hand, would let it access the medical marijuana industry, one that could grow by leaps and bounds if more marijuana-based drugs receive approval from the FDA. Scythian could be bringing in a huge payday: announcing an agreement to sell off its Colombian, Argentinian and Jamaican assets to Aphria for $193 million. Beyond distribution, Scythian is incubating marijuana research ventures at the University of Miami, University College Dublin, Universidad de la Plata and the University of West Indies. From these investments, Scythian could acquire lucrative new patents for marijuana products—from cannabis oils to new strains of pot to pill-based THC consumables. Scythian could be granted profitable patents, then watch the money roll in from licensing. The team at Scythian (TSXV: SCYB.V; OTC:SCCYF) is dedicated, professional—and led by a true visionary. George Scorsis sits on the Board of Directors for Scythian. Over fifteen years, Scorsis has led a number of companies to rapid growth, all in highly regulated fields from alcohol to energy drinks (he was key in developing Red Bull, the super popular energy drink) to medical cannabis. Formerly serving as President of Mettrum Health Corp, Scorsis built that company into a $340 million concern, just before selling it to the Canadian marijuana giant Canopy Growth Corp. The management team behind Scythian is a huge, 75-person squad scattered across the globe in Scythian’s different regional offices: Europe, Latin America, the Caribbean and North America. These pros are identifying and incubating marijuana ventures in a dozen different time zones. Scythian has access to all these opportunities and the company has harnessed the brain-power to tap into them. Scythian (TSXV: SCYB.V; OTC:SCCYF) has been lurking in the shadows, but now it’s about to burst on to the scene. And Aprhia is one of the biggest players in the marijuana space: a $2.952 billion company that dominates medical marijuana and is bound to profit from Canada’s legalization. The cannabis market may have attracted some big money, but NOBODY has realized the potential of the global weed market…except for Scythian. And with Aphria backing them, this little company is planning to make some big moves in Italy, Portugal and the UK. They’re basically incubating market outlets for Aphria’s product. ather than banking on fly-by-wire growers in North America, where markets might get saturated with pot, savvy companies should look abroad, where billions of customers remain underserved and where legalization legislation is probably not far off. As many 1.37 billion people in Europe and Latin America may soon be free to shop for pot. And Scythian wants to bring it to them before the competition discovers the opportunities. Certain statements in this press release are forward-looking statements and are prospective in nature. Forward-looking statements are not based on historical facts, but rather on current expectations and projections about future events, and are therefore subject to risks and uncertainties which could cause actual results to differ materially from the future results expressed or implied by the forward-looking statements. Such forward-looking information includes information relating to Scythian’s proposed acquisition of Marigold, MMJ Colombia, ABP and ColCanna; the expected sale of these companies to Aphria and resulting receipt of $193M from Aphria; that cannabis use and sales will grow as predicted; Scythian’s intended acquisition of a Brazil company and potential sale to Aphria; that Scythian will be in a prime position in the UK and Europe to take a substantial portion of the cannabis market when laws permit; its plans to incubate projects in various locations throughout the world; it could be granted licensable patents; and that it’s traumatic brain injury solutions will be accepted by medical practitioners. Readers are cautioned to not place undue reliance on forward-looking information. Forward looking information is subject to a number of risks and uncertainties that may cause actual results or events to differ materially from those contemplated in the forward-looking information, and even if such actual results or events are realized or substantially realized, there can be no assurance that they will have the expected consequences to, or effects on the Company. Such risks and uncertainties include, among other things: that a regulatory approval that may be required for the intended acquisitions and subsequent sale are not obtained or are obtained subject to conditions that are not anticipated; that a condition to the completion of the intended acquisitions or sale may not be satisfied; construction delays and costs overruns; potential future competition in the markets Scythian operates; that Scythian’s technology may not achieve the expected results and its accomplishments may be limited; that Scythian may not establish a market for its services as expected; competitors may quickly enter the industry; general economic conditions in the US, Canada and globally; the inability to secure financing necessary to carry out its business plans; competition for, among other things, capital and skilled personnel; the possibility that government policies or laws may change; technological change may result in Scythian’s solutions not be the best or cheapest available; Scythian not adequately protecting its intellectual property; interruption or failure of information technology systems; the cannabis market may not grow as expected; Scythian’s technology may not achieve the expected results and its accomplishments may be limited; even if it is granted patents, it may not have success at licensing its technologies; Scythian’s business plan also carries risk, including its ability to comply with all applicable governmental regulations in a highly regulated business; investing in target companies or projects which have limited or no operating history and are engaged in activities currently considered illegal under US federal laws; changes in laws; and regulatory risks relating to Scythian’s business, financings and strategic acquisitions. SHARE OWNERSHIP. The owner of Oilprice.com owns shares and/or stock options of this featured company and therefore has an additional incentive to see the featured company’s stock perform well. The owner of Oilprice.com will not notify the market when it decides to buy or sell shares of this issuer in the market. The owner of Oilprice.com will be buying and selling shares of the featured company for its own profit. This is why we stress that you conduct extensive due diligence as well as seek the advice of your financial advisor or a registered broker-dealer before investing in any securities.